Wind turbines are adding growing amounts of energy to the grid, and new parks onshore and offshore are coming onstream every day. The recent London Array (now the biggest with 630 MW) powers homes for 500.000 homes, and England won’t stop there. Traditional wind turbines like the ones shown above do have drawbacks. They need to be high to catch the stronger winds, they have to be strong to take the vibrations as one of the wings passes in front of the support pilon. They have become massive structures in part because banks (not wanting to allow wind at all) kept making up reasons why they could fail or where unsafe (and of course for a long time they where ‘unproven’). We wrote about the advantages of VAWTs. They have lower point of mass and other advantages. 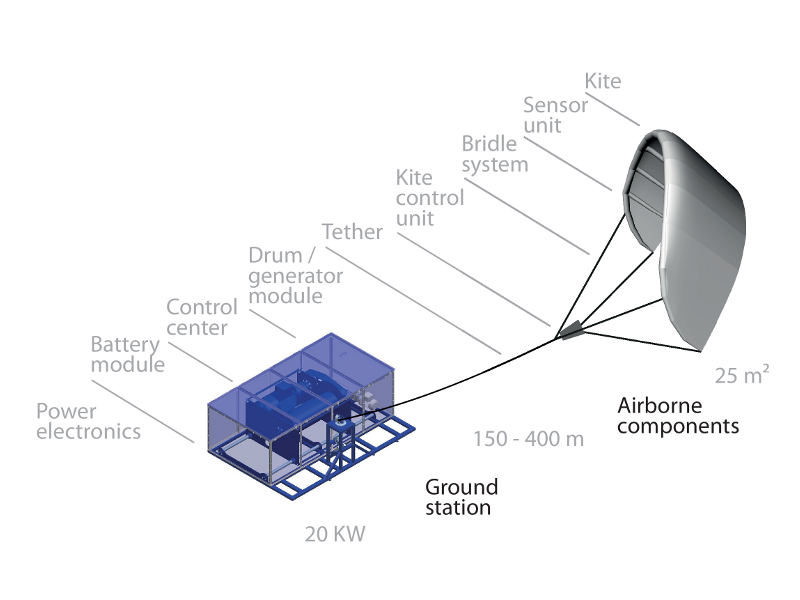 Another technology that is ready for use however are kite based systems. A kite flies because it is kept in a certain orientation relative to the wind by wires from the ground. When they have the right shape and are not heavier than the wind forces they will catch the wind and stay aloft. Normal one wire kites don’t really allow another component of wind force to become noticed, that is the effect of wing lift. 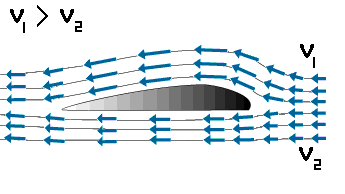 If a wing shape (crossection shown above) moves through the air, the air above it has to move faster than the air below it. This causes the air above to thin relative to the air below, and this means there is less air pressure on the wing from above than from below. This is what keeps planes in the sky, they thin air above the wings pulls them up as they fly at high speed. A kite can do the same thing, when it is moving through the air (rather than hanging in a fixed spot). The lifting force on the wing can become considerable, especially when compared to the materials needed to create them. Wing shapes, when controlled to move through the air at maximum speed, are a cheap source of power (for kitesurfers f.i.). 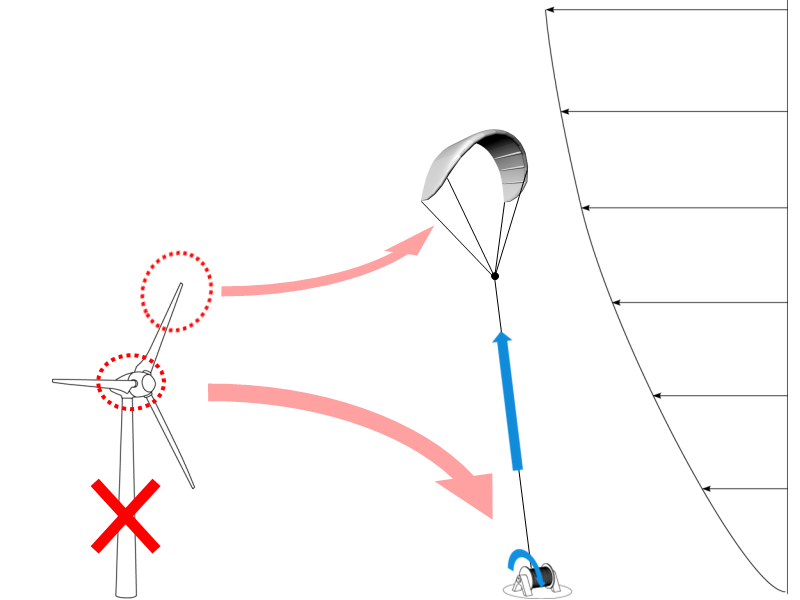 How a kite, wing or glider builds up power on the way up,and resets on the way down.. The first group was started by astronaut Wubbo Ockels in Delft. Holland has unique access to a jetstream such that the country could be powered by the wind in only a tiny part of the sky. He imagined a kite lift (or laddermill) as a means to generate electricity. 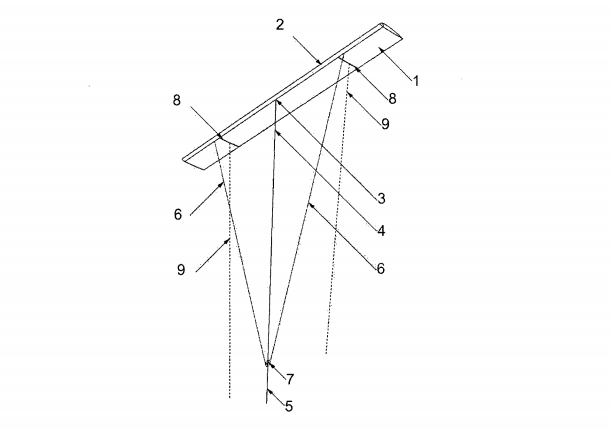 His design moved to the use of a matress kite with automated control. The group has not commercialized the technology bas far as we know and has been working on it for 10 years, which is kind of a waste of time when you can see how profitable it can be. Another incarnation of the concept of wings in the sky is Ampeyx Power in The Hague. They use a glider plane to do the same as the kite does. This company has been established by the project manager for Wubbo Ockels project. Their plane has been in development for 5 years now. 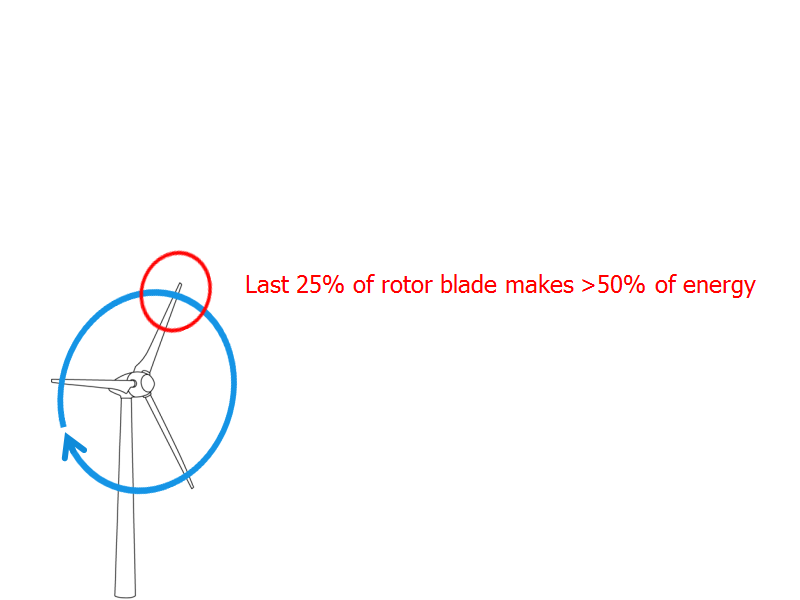 The models show that this way of generating wind turbines is way more cost efficient than conventional ones. This is great news because it means anyone can build one of these devices, which isn’t that hard. What seems to be incredibly hard is to break into the market. This however is not as difficult in every country on Earth. Another company that does offer products, and an opportunity to invest is german Energkite. Germany tends to be more fruitfull in renewable energy because gas is not such a big part of the german economy (and hence university financing). They have replaced the matress kite with a stiffer type, and have a ready to go setup for power generation. This setup should be scalebale for home use. It would be interesting to see how this type of system works on domestic homes. Yet another company harvesting wind power with a kite is Twingtec in Switzerland. This kite is more plane like but not as autonomous as the Ampyx system. 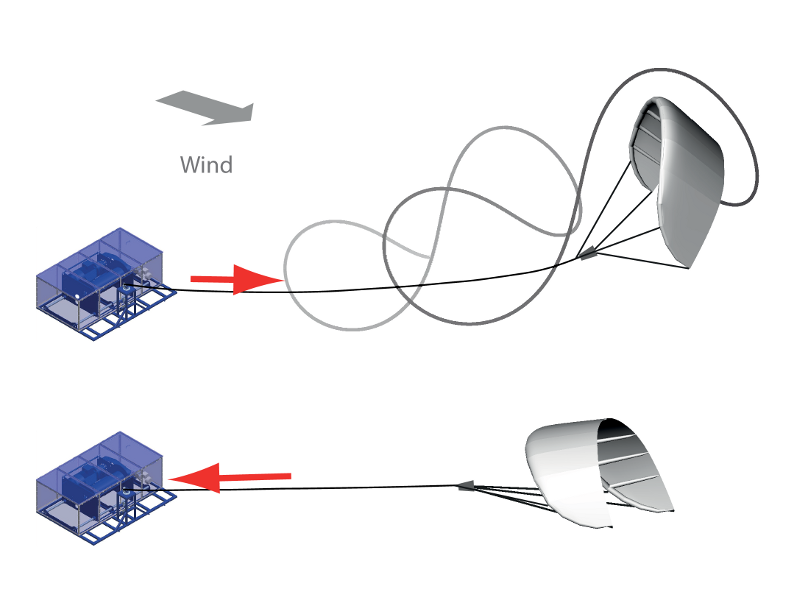 Yet another company that developed off shore kite generators is Skysails. It has kites to assist ship propulsion. Are these generator the future instead of the current bladed versions?